Engagement proposal photography is perhaps my greatest passion. In my time as a photographer, I have learned that capturing the delicate, intimate moments that take my clients from the normalcy of their daily lives to their utter surprise and sincere elation bring me the greatest joy. These special moments are ones to be cherished for years to come, and I take pride in my ability to give these keepsakes to the newly engaged. I get to take many photos of unique surprise proposal, and each shoot is as important for me to capture as it for the couple to experience. 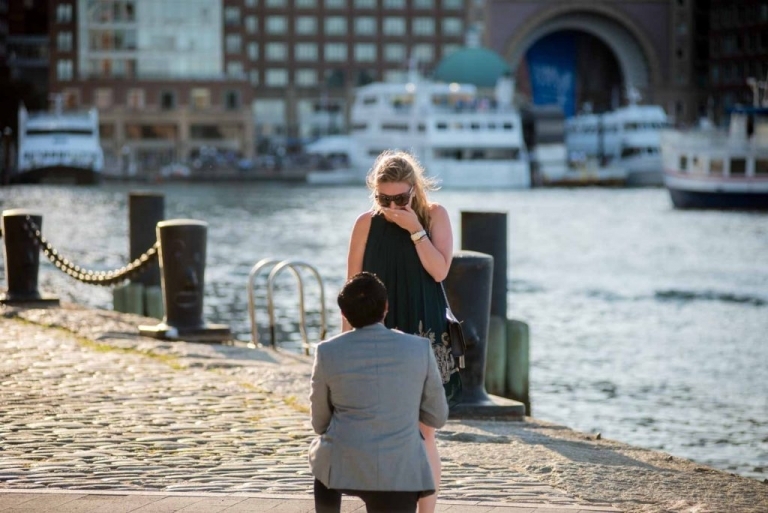 I treat each couple as individuals, therefore creating a comfortable experience for all involved as I strive to be a surprise proposal photographer Boston couples feel at home with. Recently, I was given the opportunity to be a part of something incredibly special. I was able to shoot for a beautiful couple, Dave and Emily. Dave wanted to make the experience truly special for Emily, staying true to past hobbies and passions the couple shared together. Dave went to all of their favorite breweries and held signs at each location. He captured each moment to put into an album for them. At one brewery, Dave held up a sign that said, "will." At another, a sign was shown that read, "you." This repeated at each of their beloved breweries, until each sign came together to read the question every woman can't wait to hear: "Will you marry me?" Dave forewarned me of his plans to propose formally and gave me a time and location. I went there beforehand so I could find a fantastic spot to photograph them from while remaining hidden from sight. Dave took an unsuspecting Emily on a nice, romantic walk through the field that ended with them in the determined location, and I let one of the best, unique wedding proposals I have seen play out in front of me, capturing each shot with my camera along the way. After their intimate, private moment had passed and I got to see Emily's genuine reactions captured on film, I approached her to congratulate the happy couple and make her aware of my presence. From there, I arranged a purposeful photoshoot in which Dave and Emily posed for me. Emily held up a sign that reflected Dave's earlier question, stating that she said yes! The couple posed for me in comfortable, natural ways that I helped instruct. 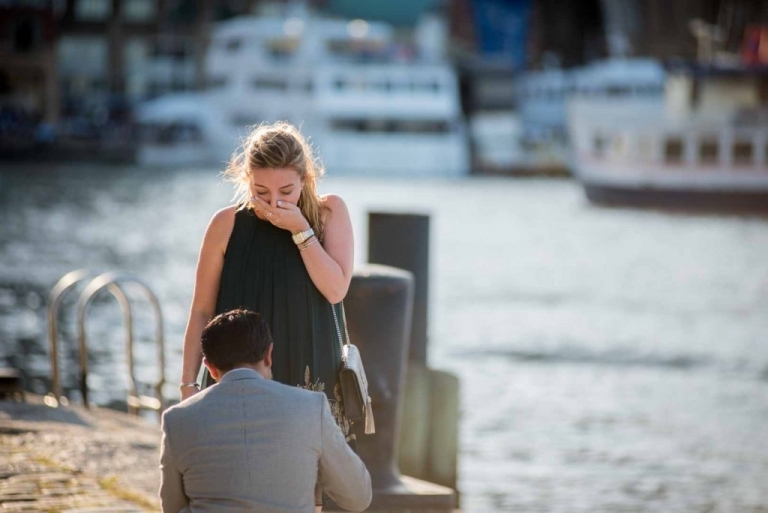 The end result was a beautiful, timeless moment captured forever in high-quality photos. 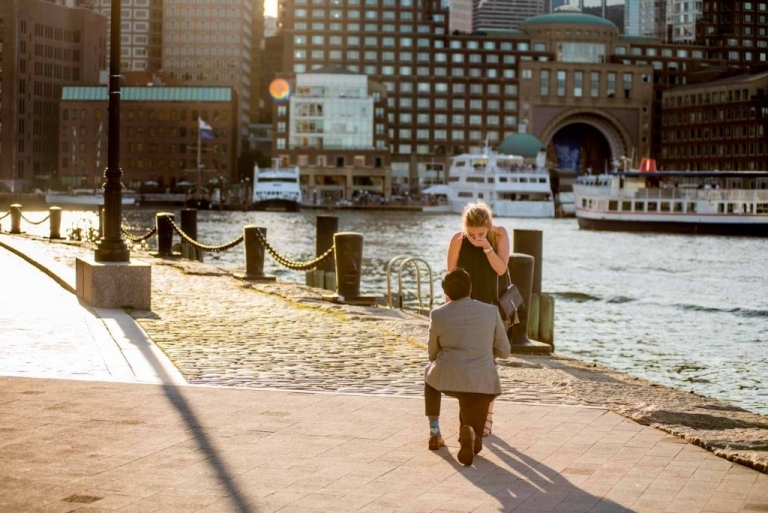 My goal is to provide surprise proposal photography in Boston to every couple I can by making their experience completely natural and comfortable with my flexible schedule and laid back attitude. I want each couple to feel like themselves as they stand before my camera lens, and I would love to do the same for you. You can contact me by phone/email with interest in my engagement proposal photography. Posted in 2016 June, Wedding ProposalTags: Houghton's Pond, She said "Yes", Will you marry me?